Words Their Way®* is a series of textbooks, activity books, activity guides, teacher’s guides, and workbooks owned by Pearson Education, Inc. that takes a developmental approach to phonics, spelling and vocabulary instruction. These texts provide K-12 teachers with instruction and word lists that correlate to students’ developmental stage of word study. *Words Their Way® is a registered trademark of Pearson Education, Inc. Spellingcity.com is not affiliated, endorsed, connected or sponsored in any way by Pearson Education, Inc.
Read the white paper on the effectiveness of using VocabularySpellingCity as a supplement with traditional textbooks. Read how one teacher uses VocabularySpellingCity to supplement her reading program for personalized learning. 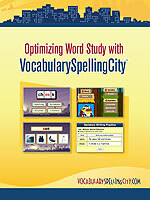 Watch a video on how to use VocabularySpellingCity.